How should the evangelical church respond to non-literal interpretations of Genesis 1-2? How should evangelical believers respond to modern scientific theory about the origins of the earth and of man? 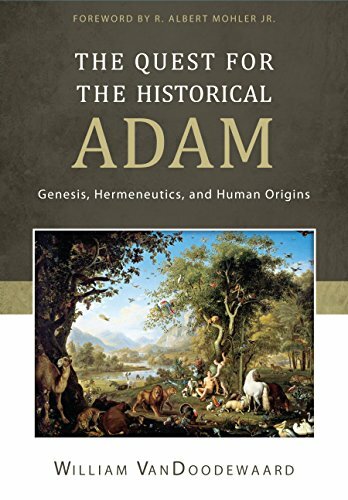 In The Quest for the Historical Adam: Genesis, Hermeneutics, and Human Origins (henceforth The Historical Adam) William VanDoodewaard takes a bird’s eye view of this subject throughout church history. By its nature The Historical Adam is replete with examples of exegesis and teaching on the doctrine of creation. VanDoodewaard’s work in compiling this resource is invaluable to the church. Each chapter focuses on a particular setting of church history and evaluates many of the best minds during the period. This effectively demonstrates how the church was dominated by a literal interpretation of Genesis 1-2 until the scientific revolution after the enlightenment. VanDoodewaard’s recounting of church history does include the exceptions to the rule and even those who disagree with his conclusion will be unable to fault his effort. Though valuable as a resource, The Historical Adam is an unvaried read. The repetition of quotes from theologians can be overwhelming. In many places these quotations are merely a summary and not the principal parts of an argument. These is equally true of the non-literal interpretation presented in later chapters. In chapter five, some of the conservative, non-literal approaches are addressed but rarely in a meaty way. Arguments seem to be dismissed simply based upon their conclusion. This method is repeated when addressing the variants of evolutionary biological processes (EBP) in chapter six. Here VanDoodewaard explicitly compares the conclusions of some of the non-literal interpretations previously covered (286-310). Unfortunately this section does not rely heavily on quotes of these proposed consequences but merely alludes back to previous summaries. This highlights the major flaw in The Historical Adam. It is a valuable resource but not a valuable discussion partner. Despite the subtitle of “Genesis, Hermeneutics and Human Origins” there is very little deep interaction with the hermeneutics of Genesis. The literal hermeneutic is repeatedly asserted and put on display but rarely brought into serious interaction with non-literal perspectives. A lone ten pages are focused exclusively on Scripture (9-19). Even then, the majority of the texts are glossed over and those familiar with non-literal interpretations will be unimpressed. In conclusion, The Quest for the Historical Adam has substantial highs and lows. It is immensely valuable in its interaction with the literal tradition of the church. It is only moderately successful in placing the church within its philosophical and scientific context (that an eternal universe dominated secular thought until post-enlightenment goes completely unmentioned). Ultimately, it is less than valuable in providing substantial interaction with non-literal interpretations.